Myco Biotic is a 10-strain probiotic which is turbocharged with a unique combination of mushrooms known for their prebiotic properties. Prebiotics stimulate the growth of the probiotic bacteria necessary for proper digestion. Daily use of Myco Biotic creates an ideal environment of friendly bacteria in the gastro-intestinal tract, and can consequently bring relief from excessive gas and bloating while preventing the development of intestinal parasites and harmful fungi such as candida. Just as importantly, Myco Biotic contributes to better overall health by improving absorption of nutrients from food. 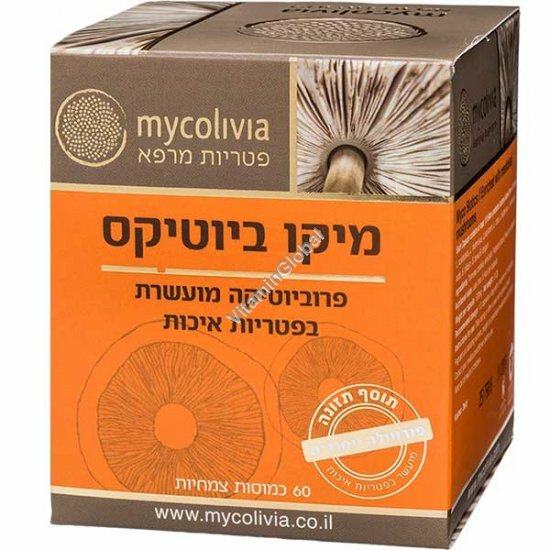 Why did Mycolivia choose to include prebiotic-rich mushrooms in a probiotic formula? A combination of prebiotics, which promote the growth of probiotic bacteria, together with a full array of probiotic bacteria creates a highly conducive environment for digestive bacteria in the intestine which is optimized for the suppression of the pathogenic bacteria and fungi that regularly try to invade the gastrointestinal tract and which, if left unchecked, lead to a wide range of health problems. The pleurotos ostreatus and trametes versicolor mushrooms found in Myco Biotic make the product more appropriate and focused for those who suffer from such ailments as heartburn, Helicobacter-pylori infections, gastrointestinal ulcers, and inflammatory bowel disease (Crohn's and Colitis). In addition, the probiotics and prebiotics in Myco Biotic make it particularly effective in treating vaginal and urinary tract infections. Pleurotos ostreatus – An edible European mushroom, commonly called "oyster mushroom" because of its familiar double-fan shape. P. ostreatus is a well-studied* prebiotic known for its high concentration of beta-glucans, which are polysaccharides which have been widely studied for their anti-fungal activity and immune system support. As such, P. ostreatus is effective in fighting off intestinal parasites and fungi, and helps evacuate excess mucus from the intestine, thus easing inflammatory conditions. Trametes (or Coriolus) versicolor – A medicinal mushroom grown worldwide, commonly called "turkey tail", also because of its shape, and used in traditional medicine for centuries. T. versicolor has been studied in depth**, and is recognized for the ability of its extracts to bring bacterial balance to the gastrointestinal tract, to reduce heartburn and excess stomach acid, to help with scab formation and wound healing including ulcers, and it has even shown efficacy in treating gastrointestinal cancers. Dosage: 1-2 capsules with a drink. For those treating Helicobacter-pylori, it is recommended to open the capsule into a small cup of water or juice and drink before a meal. General advice: If you are on antibiotics, keep at least 2 hours between taking the antibiotic and taking any probiotic products. Storage instructions: store in a cool, dry place, away from sources of heat, light and moisture. Kosher Pareve under the supervision of the Rabbinate of the Lower Galilee. Pregnant women, lactating women, people taking prescription medication, and parents considering this product for their children should consult a doctor. This information does not constitute medical advice, nor does this product substitute for any medication. In case of a reaction or other medical problem seek prompt medical treatment.